In 13/14 we hardly conceded outside of those away thrashings. Then after the world cup Mertesacker couldn’t be arsed and Kos get injured IIRC. Even when he does have a good game, he also has a rash tackle or defensive mistake in him that cost us. He’s a bang average player who got lucky with a move to a big club. Not the first time it’s happened at Arsenal. We be lucky to get anywhere near 20 million for him, but just getting him off the wage bill and out of the club is good enough for me. I be surprised if he’s here for 19/20 season. Just because it’s Emery and not Wenger, am hoping you are right. Maybe he will be ruthless and do what’s right. Even if Stan doesn’t back him, I hope he goes with someone young from the academy or elsewhere, cause with a young player, you know there is a chance to improve, even if they make a lot of mistakes. Mustafi is one of the poorest players thafs played in the premier league. Starting position is completely wrong 8 times out of 10. Typical wenger cb buy. Surely out at end of season. But sellimg him could be an issue as not sure who would buy him. Paying 35m for a player that no other top club was interested in, is bad enough, but then to pay him more than 100k a week, is just ridiculous, I don’t know what Wenger was thinking. It’s obvious that we aren’t going to get anywhere near what we paid for him, and no other club will pay his wages, so we might as well keep him here. If Chambers is sold, as well as players like Monreal, Kolisinac or Lichtsteiner, it will free up some wages and maybe a few million to go out and buy a top quality defender. The CB situation is the worst I have ever seen at the club, and really needs to be addressed. If Mustafi is starting for us next season, and we don’t get a top quality CB, then we really do know the direction the club are headed as well as the boards ambitions for us. That’s a lot of turnover without even considering the fact Kos is a candidate to be moved on due to age and injury history. There’s a very real possibility that Mustafi gets to stay by default. If Chambers goes to Fulham permanently, we don’t pick up the club option on Lichtsteiner and Monreal retires then who’s left? Sokratis, Holding, Dino, Kos and Mustafi that’s five CBs for two or three slots depending on the formation. That’s assuming Dino doesn’t go on loan and Holding is available for selection starting in August. So really we’re down to three senior CBs in Sokratis, Kos and Mustafi. I could easily see a situation where Mustafi is basically demoted and another defender is brought in ahead of him to partner with Sokratis or Kos. It would be extremely disappointing because I think we’re all ready to be done with him but it’s not beyond the realm of possibility. I think that’s what will happen. I don’t think we’ll be able to shift Mustafi and he’ll stay as a rotation CB, along with Kos and Emery will buy a decent CB to partner Sokratis of Holding. With our defensive injury record we are going to need all the defenders we’ve got. 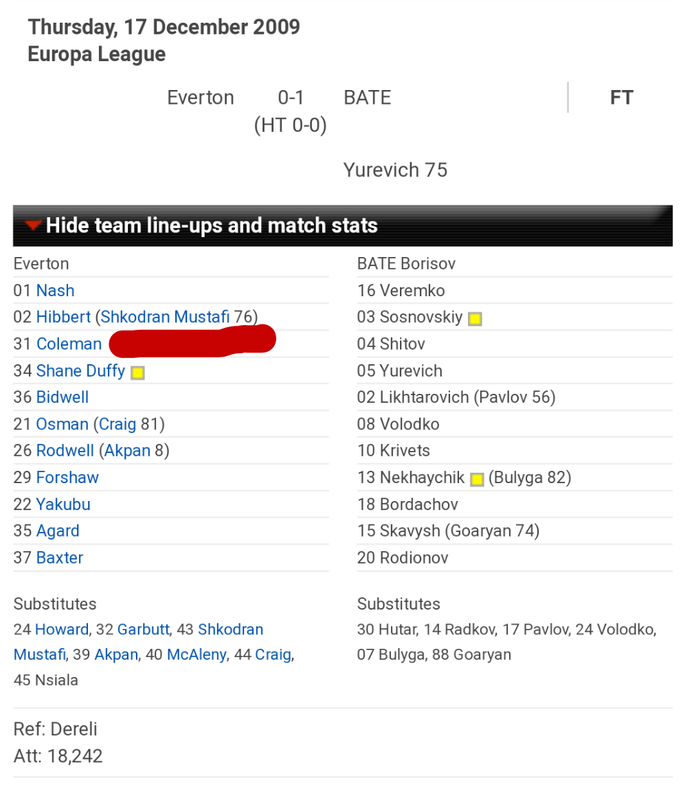 Guess who played the last and only other time BATE beat an English team? Of course it’s Big Shkod! Every game he becomes more of an Arsenal legend. Did Mustafi seriously play for Neverton? Yes, but they realised he wasn’t good enough for the 9th best reserve league team in the country so moved him on.